Sacramento-based chain which also owns Bel-Air and Nob Hill Foods. More soon. When Thomas Porter Raley set his sights on California in the mid-1930s, he was confident that he, like others nearly a century before, would strike gold. Indeed golden opportunities were waiting for the young man with stars in his eyes and hard work a vital part of his family ethic. Those who knew him are quick to say that Tom Raley, the 13th of 14 children born to Nancy Jane and Reglus Raley, had a gift for brash optimism. “Nothing is impossible” could have been the motto of this tall, red-haired lad from Lead Hill, Arkansas. Honesty. Integrity. Hard work. Loyalty. Enthusiasm. These were the qualities that would turn Tom Raley’s golden dreams into one of the nation’s top-rated supermarket chains. From his first store in Placerville, Tom Raley’s adventurous spirit took him to Sacramento and the great Central Valley. 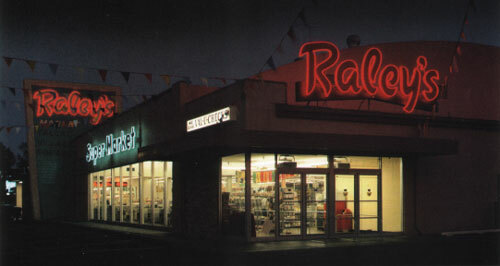 Soon Raley’s stores were rising across Northern California and Nevada. • The first drive-in market. • The first pre-packaged meat department. • The first supermarket natural foods department. A good idea was a bright spark to Tom Raley’s imagination … as long as it served his customers. “Treat our customers the way you’d like to be treated,” he told his employees, “and they’ll come back.” That was – and still is – Raley’s Golden Rule. An ambitious dream is now a successful reality. Millions of customers shop each week at Raley’s Superstores, Bel Air Markets, Food Source and Nob Hill Foods; 134 stores in all. Young men and women find their first jobs with us, then go on to develop lifelong careers. Education, the arts and family-centered activities flourish in Raley’s communities because of the chain that Tom Raley built. Under the guidance of his only child, Joyce Raley Teel, the company is hard at work “Caring For Our Community.” The Food For Families program, for instance, has provided more than $7 million in cash and food donations to the area’s less fortunate. Today, Tom Raley’s family carries his dream into a new era. Jim and Joyce Raley Teel serve as co-chairmen of the board of directors. Their children participate in the business. Together the family – along with a large and loyal family of employees – is leading Raley’s into a bright new century of growth. On the way, customer service remains a priority. It’s one way to show our appreciation – and the way Tom Raley would have wanted it.